Domini Games invites you to join an elite group of underground mystery solvers in the debut of an exciting new brand! 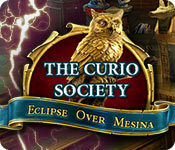 The Curio Society: Eclipse Over Mesina is rated 3.6 out of 5 by 17. Rated 5 out of 5 by cathybobcat from SE IS THE WAY TO GO I bought this in the CE and liked it enough to play it twice, but was very disappointed in the lack of Extras. You collect dossier pages of the characters....forgot how many because I was unable to access all the pages in the book in the Extras, as well as the notes you collect. It would only show the last note and dossier collected, so when I played it a second time, I was sure to read the dossier pages. The notes come up in the scenes as you collect them and you are able to read those and it wasn't necessary to access them in the Extras, but I still think I should have been able to do so. You collect coins to buy 12 items for a Relic room which was entertaining, but nothing to warrant a CE price. The biggest disappointment of all, is NO REPLAY of hos or puzzles. I thought the hos were very artistically done and wanted to have the luxury of being able to do them again as well as some of the puzzles. I felt very cheated that this was not included in the CE package and do not think it is CE worthy whatsoever. The bonus chapter is short and a prequel. I didn't enjoy it except for a couple of the hos. It takes place in the Egyptian desert...not very impressive. There were some very annoying puzzles, one in which if you made a mistake you had to start all over. It was ridiculous and although I trudged through it the first time I played the game, I skipped it the second time around. Aside from being a bit short, I think it is an excellent SE and was very enjoyable. The graphics are exquisite, clear and defined, and very colorful. For the most part, it is a player friendly game that was relaxing and is one reason I really do like it. I paid attention to some detail in this and noticed that the pitcher you collect in order to obtain water from the fountain to make a circular pillar mold was a Fenton melon pitcher vase. It was absolutely beautiful. I loved it. 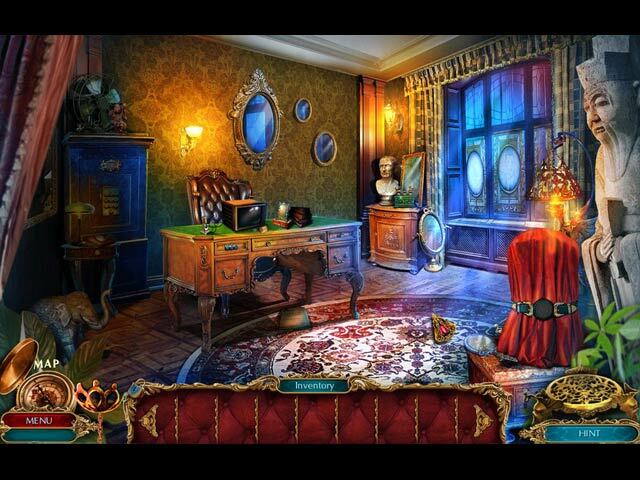 There are numerous puzzles, but the majority of them were enjoyable. There was one that was a real pain and eye straining and that was the one where you construct a picture and every single panel you touch moves everything else. It was terrible and so difficult to even make out. It was one of the few I skipped. There is some going back and forth, but not in excess. Jump map is very artistically done. A great deal of work went into it. 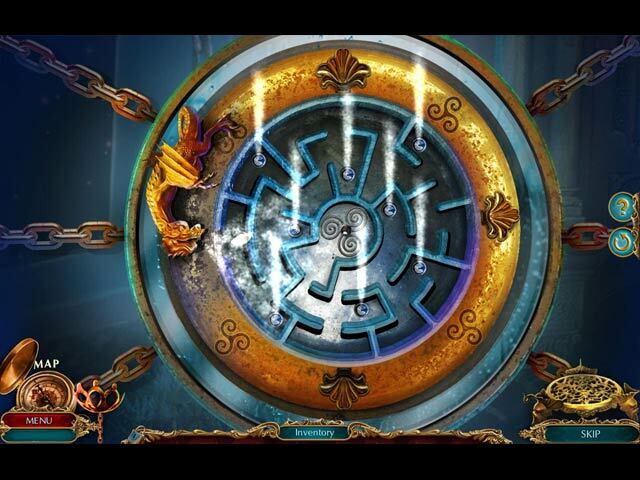 You can play Match 3 if you do not care to do a hos and you can also skip puzzles, of course. Hint is very helpful and directional. There is not an excess of the collecting of inventory, but there are times when it will take a long time to collect a needed item in a particular scene, so I did utilize the map when I would forget and think, "Now where does this go?" The scenes were so well done in this and some of them were stunning. There is a scene near the end of the game, "The Floating Island" that is awesome. What creativity and artistry. I am positive I will play this game again in the future. Rated 5 out of 5 by Dainy from Lots of extra games I like this game more than most that I have purchased lately. It is full of games and they are doable. I love that the hint button recovers quickly since there is no Strategy Guide. The art work is beautiful and the story is not as gruesome as some. I will try the other versions. Rated 5 out of 5 by denniann2 from find out who wants to rule the world there is a custom level and an interactive map. you are trying out for the curio society after getting a mysterious message to report somewhere. you get help from a woman. she is also from the curio society and you are working together to find out who is behind the destruction. you have a light canon gun that can destroy the gargoyles and it gets charged by loading it with moon lenses. she has another type of gun that uses crystals. sequel....the way it ended i am fairly sure!! Rated 5 out of 5 by bwake47 from I LIKE THIS GAME!! I don't understand all the negative reviews on this game. I almost didn't demo it, but after watching the video decided to give it a try. I'm very glad I did. The graphics were excellent imo, and I liked the way objects would move when you clicked on them (horses over the doorway comes to mind). The map shows where action is available and allows you to jump. A suitcase that gives you background history when evidence is found. I like watching gargoles flying around and the fact you have a secret weapon you can shoot them with to save someone. All in all I enjoyed the demo and definitely plan to purchase the game. I didn't demo the CE, sometimes the extras distract from the game. I like to just concentrate on the adventure. Don't go by all the reviews, try it out for yourself. We all have different tastes and some of us are just getting tired of the genre. Might need a break. I know I took a break for a while and now enjoy the games once again. Rated 4 out of 5 by Bugirl from Too Short The game was ok - good enough to buy it at the $2.99 price anyway. Problem was that I got the whole thing finished within 1 day which is very unusual for me. Rated 4 out of 5 by deddu from Who Wants to Destroy Mesina Track the villains through good graphics and interesting hidden objects and mini-puzzles. You have a suitcase to give you background, a map and a hint key that will transport you to your next objective. Rated 4 out of 5 by Aliana_4711 from Between 4 and five stars. My rating is based on the following: Excellent graphics, not disturbing music and fitting background noises. A lot of fine details along the game with fitting noises just for fun. The animation is okay, but could have been a little bit better. Voices are really great and speeches were excellent. Difficulty can be customized, but e.g. helpful messages could not be excluded. Challenge was interesting enough, the objects are spread all about 4-5 locations. The mini games aren’t not that new, but they did have some new nice adjustments, e.g. ball-labyrinth with air pushes. The idea with the “energy-ball Harry” was great and the “Harry animated animals” were nice and funny. Additional, the investigation case has to be considered, that makes it more challenging. You can switch between HO and 3 matches. Some dislikes for not giving fully 5 stars: It took not even four hours to play through, it could have lasted longer. For finding a needed item, you often have to go back and for about 4-5 location. I don’t want to use the map, if I’m not stuck, so going back and for and back and for, is a little bit bugging. 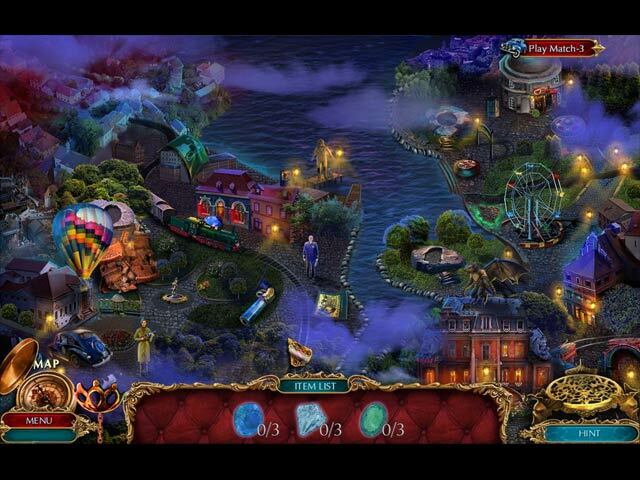 I’m wondering, why all bad sorcerers, ghosts… in most of all creeps games, have to do that annoying “ha,ha,ha”. I can easily go w/o this. The character of the sorcerer Ignotus is too naive designed. Like a child would have drawn him. From my point of view, a character like him, should have been more interesting. Rated 4 out of 5 by patricia356 from Better Game than earlier reviewed While I understand some reviewers' frustrations over the same old stories (I gave up on a game preview that started with a car going over the cliff-again) I think this game merits a little better review. The graphics were excellent and I liked the sound track much better than most. Yes, the story line seemed sort of familiar. But I thought the characters were different and I liked the "secret society" theme. Searching for items that made little sense at times that made no sense???? Par for the course. Some rather highly rated games do the same. I have stopped playing some of the series because of this. I only played the demo but enjoyed it. The game is fairly easy and so far not overwhelmed with ho scenes. It took just playing some of the games to understand the directions-another par for the course for me. I would probably get this with one of my free game coupons or during a sale. Or maybe just buy it outright. Give it a try for yourself. Rated 4 out of 5 by donadriedger from What's with the bad reviews? I thoroughly enjoyed the demo on this one. The story is new - ish, and the graphics are excellent. You have some different tools this time; the suitcase does tell you about the items you find and gives you a piece of the story. You have an energy sphere thingy, which allows animals to assist you (at least that's what it has done so far in the demo), and you have a gun that can kill the gargoyles. The puzzles are not frustrating, I only had to skip one, so they are not totally simple, either. I liked all the voices, and the ambient sounds. The HOs in the demo seemed to be all of the list type, which are my favourites, anyway. There are some matching challenges and I love the star charting scenario....really fun. I think there is something for everyone in this game. Nice change. Rated 3 out of 5 by fundit2 from mixed between super easy and frustrating puzzles I had to use the blog a couple times rather than skip puzzles, as I really hate to skip them. Then I got to the end and it was a puzzle that I hate playing, so I had to skip the battle with the evil sorcerer! I won't say what type of puzzle, but it's one I just really dislike playing. Plot was pretty usual, evil is trying to take over the world, in this case with a henchman and you are recruited by a secret society to solve the mystery of how and why. It's the first of a series, so I'll have to try the next to see if this is one I'll hunt for to add to my list of games. You'll have to try it out for yourself.